The dissipation of total kinetic energy, which indicates how efficient the global atmosphere is as a heat engine, was on the rise between 1979 and 2013. Scientists sometimes think of a planet's atmosphere as an engine. Potential energy, supplied by heat from a parent star, is converted into kinetic energy, producing winds that swirl around the planet and drive storms. 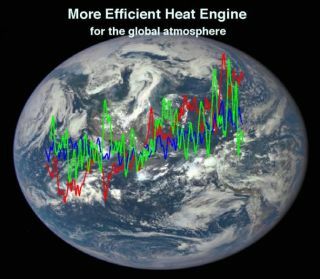 This heat engine on Earth has become more efficient because of climate change, and greater efficiency is not necessarily positive in this context. It could mean more dangerous cyclones, hurricanes and storms on Earth, according to a team of planetary scientists who are applying their understanding of the energy cycles of other planets to Earth's disrupted climate patterns under human-induced climate change. Climate scientists have been warning that destructive storms will be a greater threat as the planet warms. The new study shows that the atmosphere's energy cycle could be one way to "diagnose" and understand that storm activity, Li said. Li and his colleagues have been analyzing data from NASA's Cassini mission to the Saturnian system and the Juno mission to Jupiter to study the atmospheres of other worlds in the Solar System. Li has been a participating scientist on on a number of Cassini and Juno's instruments. His team found that Saturn's biggest moon, Titan, has a balanced energy budget (just like Earth), and the team investigated how a giant storm on Saturn, tens of thousands of kilometers wide, changed how the planet absorbed solar power. Evaporation, convection, rainfall and winds can even out heat imbalances in the atmosphere. Here, cumulus clouds carry solar energy away from Earth's surface over South America. "I wanted to apply these ideas of planetary energy to our home planet —Earth — to examine if the energy cycle can help us better understand ongoing climate change," Li said. In 1955, the MIT scientist Edward Lorenz — who gave us chaos theory and "the butterfly effect" — came up with a complex formula to explain how potential energy is converted into kinetic energy in the atmosphere. The so-called Lorenz energy cycle is known to influence climate and weather. Past studies looking at variations in the cycle covered short periods of time, only up to 10 years, not long enough to link those observations to well-documented recent changes in the climate, like global warming. "Our study is the first to check [the energy cycle's] long-term temporal variations, which is mainly based on the modern satellite observations," Li said. "The long-term increasing trend is somehow a surprise," Li said. This new research probably won't directly affect climate-change predictions beyond the more general forecast of more storms in the future, Li said. The study did, however, identify some hotspots where the positive trend in storm energies seems to be particularly strong. Most of those hotspots were in the Southern Hemisphere, notably the storm track around Antarctica. But increased storm energies were also found over the central Pacific Ocean, where scientists have already documented an intensification of tropical cyclones. Such studies would provide us a "wide perspective" to understand atmospheric and climate systems, Li said. "In particular, the past climate evolution on Mars, in which Mars changed from a warm and wet planet to the current cold and dry world, will help us better understand and predict the climate change on our home planet," Li added.